Millions of believers are currently leaving the organized church, without giving up their faith. 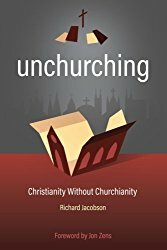 Sadly, many are only defining themselves by what they don't do, as Christians who simply “don’t go to church.” It’s time for these believers to catch a vision for genuine spiritual community, outside the walls of organized Christianity, a way of being the church without going to church. This audio book is still in production.